The Insurance Institute for Highway Safety has come out with their annual list of the safest vehicles on the road. Who makes the safest cars.....FORD! Ford and Volvo put 16 vehicles in the top 72, that is 22% of the top vehicles were Ford's. Honda came in second with 13. And, it isn't just the IIHS that ranks Ford #1. JD Power ranks Ford higher than Toyota and Honda across all of their brands, in reliability. While some of the Luxury vehicles take the highest rankings, the combined rankings of all their car lines puts Ford above GM, Honda, and Toyota. Come in and get one of the safest and most reliable vehicles at Thoroughbred Ford. Ford will be coming out with the most fuel efficient Hybrid in the industry. The 2010 Ford Fusion Hybrid is state of the are, and it looks great too. Order yours today at Thoroughbred Ford! LOS ANGELES, Nov. 19, 2008 – Ford’s new 2010 Fusion is set to shake up the cut-throat mid-size sedan segment when it goes on sale early next year, bringing an all-new hybrid that will deliver the best fuel economy of any sedan in America, unsurpassed 4-cylinder gasoline fuel economy, more power, class-exclusive technologies including a blind spot detection and warning system and Ford SYNC, more total passenger and luggage capacity than the Toyota Camry, plus proven quality and reliability that has been recognized by the top consumer groups and magazines. Ford’s attention to detail with the freshened Fusion begins with a new design that gives the car a look that is both sportier and more upscale as well as improved aerodynamics. The car’s newly designed front end, including a powerfully domed hood, and new headlamps, grille and larger fog-lamp area further enhance the sporty nature of the 2010 Fusion. Aerodynamic enhancements and new underbody shields further boost Fusion’s fuel economy. Overall, the wider, sportier look aims to make Fusion even more appealing to customers eager for a fun-to-drive mid-size sedan. With all models, the interior design team created a more contemporary, technical look with metallic new finishes on the instrument panel that carry through on the center console, doors and steering wheel. The all new instrument panel is finished with a soft upper and lower skin and has much less hard plastic than Japanese competitors. The instrument panel displays and switches have also been updated with a contemporary iced blue lighting. A redesigned leather wrapped steering wheel with form fitting palm swells, a new shifter, and wrapped and padded armrests increase the Fusion’s sportiness and comfort at all key driver touch points. The seats received a makeover, as well. The seat contour has been revised, with more side support and overall a more comfortable seat with smoother bolsters and more-textural inserts. The seats also feature contrasting stitching and leather inserts to give the Fusion even more attitude, befitting this mid-size sedan. The gauge cluster has been designed with day time backlighting, a black lens, and 3-D elements to create a high tech jewel-like appearance, similar to a fine watch. Drivers will be greeted by a new “welcome” sequence that makes the Fusion seem as if it’s coming to life. Gauge needles sweep back and forth as the lighting and new chimes come on. The ambient lighting system offers the option of illuminating the front and rear footwells and front cup holders. Both the inline four-cylinder and V-6 engines are upgraded for both improved fuel economy and power. The standard Fusion S model equipped with Ford’s new 2.5-liter I-4 engine is expected to deliver at least a 6 mpg improvement versus the 2009 model on the highway, resulting in fuel economy that is at least 3 mpg better than the Honda Accord and 2 mpg better than the Toyota Camry. The 2.5-liter I-4 engine horsepower and torque also have been improved from the car’s outgoing 2.3-liter 4-cylinger engine, jumping to 175 hp and 172 ft.-lbs. of torque from the previous 160 hp and 156 ft-lbs. As a result, 0-60 performance improves by more than a second, now topping Camry and Accord. The 2010 Fusion features an all six-speed transmission lineup, including for the new 2.5-liter I-4 engine, which is available with either a six-speed manual or automatic transmission. The previous 2.3-liter I-4 in the Fusion was available with only five-speed transmissions. The additional gear on the I-4 provides better drivability and performance as well as fuel savings, said Matt Hettenhouse, Powertrain Team Leader for the Fusion. “The gear ratios and the overall span of the transmissions allow us to have a more-efficient and higher performing shift schedule,” he said. The first gear can be made a little deeper, which provides smoother acceleration. At the top end, a higher gear allows the engine to run slower in highway conditions, which also aids fuel economy. Ford’s proven Duratec30 3.0-liter V-6 engine was also improved on the 2010 model, delivering highway fuel economy gains of at least 1 mpg city and 2 mpg highway. Horsepower in the 3.0-liter V-6 also increased to 240 hp and 222 ft.,-lbs, up from 221 hp and 205 ft.-lbs. in the previous version. The 3.0-liter engine is now flex fuel-capable and can run on E-85 ethanol, which delivers even more horsepower – up to 250hp. For maximum performance, the Fusion Sport features a 3.5-liter V6 that has 263 hp and 249 ft-lbs of torque on runs on standard unleaded fuel. Front-wheel drive and on-demand all-wheel drive are available with models with a 3.0-liter engine and with the new Fusion Sport 3.5-liter engine. Both V6 engines are also available with SelectShift for individual gear control. The versatility in the powertrain systems creates a wide range of options for customers designed to fit every need. The 2010 Fusion now comes equipped with Electric Power Assist Steering (EPAS) system on 2.5- and 3.0-liter models, improving the driving dynamics of the vehicle while delivering greater fuel savings because the steering system is operated by the electrical system rather than the engine. Additionally, EPAS provides customers with improved steering feel and reduced low-speed efforts that when coupled with a nearly 1 foot smaller turning circle for 2010 makes parking a cinch. Fusion's front stay bar and rear suspension link geometry have been revised to improve steering, handling, and ride. The suspension springs, shocks, and sta-bars have also been retuned to take full advantage of the revised geometry and new steering system. In addition to improvements in the 2010 Fusion’s steering, handling and improved brake pedal feel, the Fusion team also took a look at how to improve the comfort of the car, including reducing wind noise and road noise. Acoustic windshield, thicker front door glass, new hood insulators, inner and outer dash absorbers, and carpet, revised sealing baffles, additional sound deadening in the trunk, and new interior headliner absorption material are among the improvements made for overall sound level and quality. Improved body and door sealing also contribute to Fusion’s best-in-class standing in wind noise. Overall, the reduction in wind noise and road noise puts Fusion near some of the best luxury cars in terms of quietness and speech intelligibility. Wind noise, for example, is 3 sones better than Camry and Accord. Models with the I-4 engine are class leaders in wind noise. 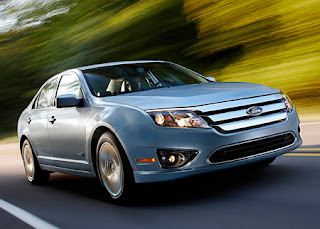 For the 2010 model year, the Ford Fusion adds an all-new hybrid model. The Fusion and Mercury Milan Hybrids join the Ford Escape and Mercury Mariner Hybrids, doubling both the size and volume of Ford’s hybrid lineup. “Offering consumers more fuel-efficient vehicle choices, including improving and increasing our hybrid vehicle offerings, is part of Ford’s broad plan to deliver technology solutions for affordable fuel economy for millions,” Kuzak said. The Ford Hybrid team has developed a powertrain system that combines the best attributes of the gasoline engine and electric battery-driven motors to deliver the optimal experience for the customer in terms of driving performance and fuel economy. Additionally, the propulsion system for the Ford Fusion and Mercury Milan hybrids transitions between gas and electric power and back more efficiently and seamlessly. The overall system upgrade allows the Ford Fusion and Mercury Milan hybrids to operate longer at higher speeds in electric mode. The hybrid vehicles can operate up to 47 mph in pure electric mode, approximately twice as fast as some competitors. Plus, the city driving range on a single tank of gas is expected to be more than 700 miles. New 2.5-liter 4-cylinder engine (155 horsepower/136 lb.-ft. of torque) running the proven Atkinson cycle mated to an electronically-controlled continuously variable transmission or e-CVT. Intake Variable Cam Timing (iVCT), which allows the vehicle to more seamlessly transition from gas to electric mode and vice-versa. The spark and cam timing are varied according to the engine load to optimize efficiency and emissions. Enhanced electronic throttle control reduces airflow on shutdowns, reducing fueling needs on restarts. Wide-band lambda sensor analyzes the air-fuel ratio and adjusts the lean/rich mixture accordingly to keep the system in balance and to minimize emissions. A new smaller, lighter nickel-metal hydride battery has been optimized to produce 20 percent more power. Improved chemistry allows the battery to be run at a higher temperature and it is cooled using cabin air. An added variable voltage converter boosts the voltage to the traction battery to operate the motor and generator more efficiently. A new high-efficiency converter provides 14 percent increased output to accommodate a wider array of vehicle features. Smarter climate control system monitors cabin temperature and only runs the gas engine as needed to heat the cabin; it also includes an electric air conditioning compressor to further minimize engine use. The regenerative brake system captures the energy normally lost through friction in braking and stores it. Nearly 94 percent energy recovery is achieved by first delivering full regenerative braking followed by friction brakes during city driving. A simulator brake actuation system dictates brake actuation and delivers improved brake pedal feel compared to the previous generation braking system. The Fusion Hybrid also offers drivers a way to be more connected to the hybrid driving experience thanks to Ford’s SmartGauge with EcoGuide, a unique instrument cluster execution that helps coach them on how to optimize performance of their hybrid. SmartGauge with EcoGuide features two, high-resolution, full-color liquid crystal display (LCD) screens on either side of the analog speedometer that can be configured to show different levels of information, including fuel and battery power levels, average and instant miles-per-gallon. EcoGuide uses a multi-layered approach to coach the driver to maximum fuel efficiency. A tutorial mode built into the display that helps the driver learn about the instrument cluster and the hybrid in a whimsical way that does not overpower. Technical enthusiasts will love the detailed gauges that will help them learn to become more efficient in their driving. Everyday drivers will love another new feature in this same gauge cluster. Called “Efficiency Leaves,” the system “grows” leaves and vines on-screen to reward customers for efficient driving. All levels can show instant fuel economy, fuel economy history, odometer, engine coolant temperature, what gear the car is in and trip data (trip fuel economy, time-elapsed fuel economy and miles to empty). The engine coolant temperature indicator turns green when engine conditions are warm enough to allow engine pull-down. Several other elements help differentiate the Ford Fusion Hybrid from its gas-powered sibling, including unique hybrid “road and leaf” badging on both sides and the rear of the vehicle; unique 17-inch, eight-spoke wheels; eco-friendly seat fabric made from post-industrial 100 percent recycled materials; and a standard 110-volt power outlet. The base 2010 Ford Fusion already is a fun-to-drive mid-size car. With an even sportier look, a bigger, more-powerful engine, special 18 inch wheels and upgraded suspension tuning to go along with a distinctive interior, the new 2010 Ford Fusion Sport is a dynamic, welcome addition. The 263-horsepower V-6 Duratec engine is mated to a six-speed automatic transmission with SelectShift. Front-wheel drive is standard, with all-wheel drive available. The sport-tuned air intake system provides the fun-to-drive, powerful and sporty powertrain sound attributes expected in the 2010 Ford Fusion Sport to complement the driving experience. Building off the improvements for the Fusion line, the 2010 Ford Fusion Sport also features a unique lower grille for a more functional look, larger beveled bright-tip dual exhausts, side rocker moldings, a decklid spoiler and unique Sport badging. Eighteen-inch painted aluminum wheels are standard. The interior reflects its sporty nature as well. As with the base models, the Fusion Sport’s instrument panel and center console deliver a more-technical, content-driven look. Fusion Sport includes a Charcoal Black interior with a high tech soft touch dark gray finish available. Sport Blue or Sport Red interior accents are also available, depending on exterior color selected. These give the instrument panel and console a sportier look as well, which carries over to the seat inserts and contrast stitching. Overall, the Fusion Sport is a driver's car that is both comfortable and exhilarating at the same time. Blind Spot Information System (BLISTM) with Cross Traffic Alert, which can help provide extra confidence to drivers in parking lots by alerting drivers sooner of nearby traffic while backing out. It uses two multiple beam radar modules, which are packaged in the rear quarter panels. The radar detects moving objects within a 65-foot range from either side of the vehicle. The radar identifies when a vehicle enters the defined blind spot zone and illuminates an indicator light on the corresponding side-view mirror providing a warning that a vehicle is approaching. An audible alert is sounded as well. SYNC: The voice-activated hands-free in-car communication and entertainment system developed by Ford and Microsoft. The system fully integrates most Bluetooth-enabled mobile phones and digital media players, providing customers hands-free cell phone and music selection capabilities – plus new 911 Assist and Vehicle Health Report provided with no monthly fees. Vehicle Health Report (VHR): SYNC gathers relevant information from the major vehicle control modules and packages diagnostic data into a usable format in a matter of minutes. That data packet is sent to Ford via an 800-number automatically dialed using the customer’s paired and operable mobile phone. Voice-Activated Navigation, which integrates several functions including voice recognition destination entry, climate control and SIRIUS satellite radio into one easy-to-use system, displaying them on an 8-inch touch-screen display. The navigation system’s text-to-speech function calls out street names while in route to a destination and reads incoming text messages when the system is linked to SYNC. The integrated DVD player is capable of reading CD-Audio, MP3 CDs, DVD, DVD-Audio and DVD-ROM (for digital map updates). A music jukebox function stores more than 150 hours of music. The screen even can be customized with personal photos. SIRIUS Travel Link™, an industry-leading technology that, when combined with the voice-activated navigation system will provide users with real-time traffic data with accident and incident information, coast-to-coast weather data including current conditions and five-day forecasts, and fuel price information for over 120,000 gas stations. Travel Link also offers sports scores and schedules and a listing of more than 4,500 movie theaters with movie times, theater addresses, movie synopses and more. Reverse Camera System, which mounts a small camera on the decklid that is activated when Fusion is shifted into reverse, giving the driver a clear view behind the vehicle. The video image is displayed in the optional navigation screen on Fusions equipped with that option or in the self-dimming rearview mirror vehicles without navigation. Ambient Lighting System allows drivers to customize the interior lighting to suit their mood through seven base colors – ice blue, purple, blue, orange, red, white and green. Sony-branded audio system. The Ford Fusion is the first mid-size sedan in North America to offer a Sony-branded audio system with surround sound and Sony DSP processing as a factory option. The Sony-branded audio system features 390 watts and 12 speakers that make substantial use of high-quality speaker materials, including polypropylene cones, three-layer soft dome tweeters and large neodymium magnets for most speakers in the system. EasyFuel™ Capless Fuel-Filler System also is standard. This industry-exclusive feature eliminates the need to touch dirty gas caps and helps to reduce evaporative emissions that create smog and global warming. When fueling is completed and the fuel pump nozzle is removed, the system automatically seals shut. Cabin Air Filter is standard for the first time on the Ford Fusion. The filter removes respiratory irritants and toxins caused by traffic and industrial pollution. The filter also provides an additional safeguard for the climate control system. With a bolder new design, class-leading and unsurpassed fuel economy and performance depending on model, a host of segment-exclusive new features and technologies, greater trunk capacity and storage versatility than Chevrolet Malibu, Toyota Camry and Nissan Altima, improved drivability and comfort and even more choice across the lineup, the 2010 Ford Fusion is poised to win over even more mid-size car customers. Ford Fusion is built at Ford’s Hermosillo (Mexico) Stamping and Assembly Plant and will be in dealer showrooms in spring 2009. Ford Motor Company, a global automotive industry leader based in Dearborn, Mich., manufactures or distributes automobiles across six continents. With about 224,000 employees and about 90 plants worldwide, the company’s core and affiliated automotive brands include Ford, Lincoln, Mercury, Volvo and Mazda. The company provides financial services through Ford Motor Credit Company. For more information regarding Ford’s products, please visit www.ford.com. 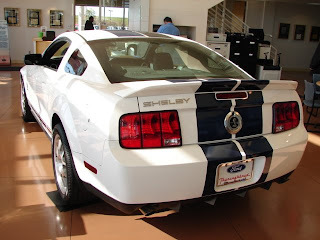 We are auctioning off our last 2008 Shelby GT500 on EBay. If you want a bargain now is the hour. There is no reserve so bid, win and it is yours.